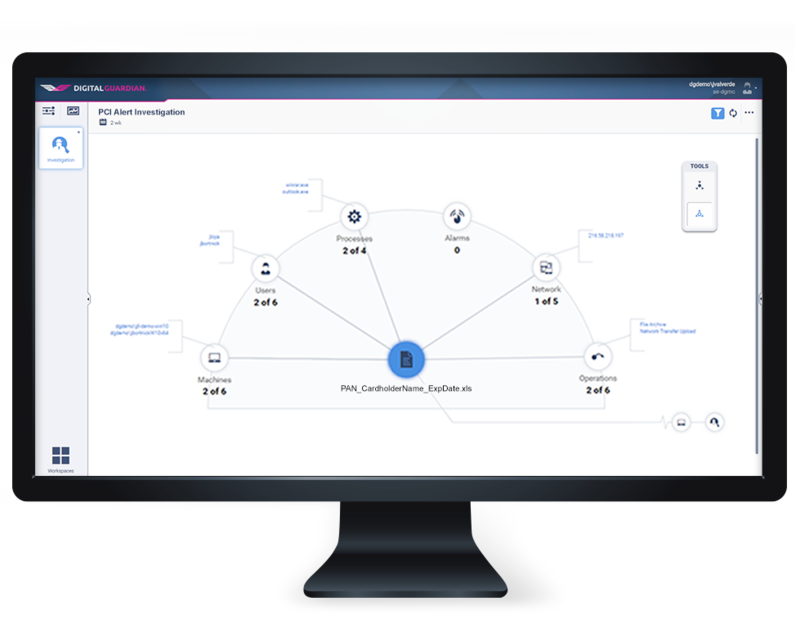 Digital Guardian for PCI/DSS compliance combines data discovery, data classification and data loss prevention into a single, easy to manage appliance. Find and protect customer financial data at rest, in use and in motion with high accuracy and low overhead. Consumers rely on payment card transactions millions upon millions of time each day, vendors must provide a secure environment for these transactions. The information that flows from the consumer to the vendor is a valuable target for data theft, or accidental disclosure. Regardless of how it gets out, PCI data exfiltration can lead to customer churn, negative publicity, fines, or higher costs to the business overall. Information security leaders need a solution that can accurately find PCI data, recognize it when put at risk, and deliver automated controls to protect the sensitive data before it is externally exposed. Digital Guardian addresses PCI DSS v3.2 requirements to protect cardholder data, encrypt cardholder data, implement access controls, and monitor & test your environment. Our DLP delivers the visibility to locate sensitive PCI data throughout the extended enterprise and into the cloud then apply the proper controls to support compliance. Real time education, at the time data is put at risk, supports compliant behavior throughout the organization. Our proven deployment methodology speeds time to compliance, increases accuracy and reduces overall support costs. Options range from physical or virtual appliances to fully managed solutions. Digital Guardian analytics and reports can provide the key documentation to demonstrate PCI DSS compliance. Our enterprise wide reporting shows where payment card data is located, how it’s used and what mechanisms you have in place to enforce PCI DSS data protection principles. Our controls operate silently until needed, then automatically respond to risky behavior. Employees are educated in real-time on the appropriate handling of payment card data via display prompts that request justification for actions that put data at risk. Actions that violate data protection policy are blocked or contained before personal data gets out. Digital Guardian enables you to effectively discover, monitor and control PCI DSS data. Our solution can see and control PCI DSS data upon creation, edit, save, upload, or transmission.